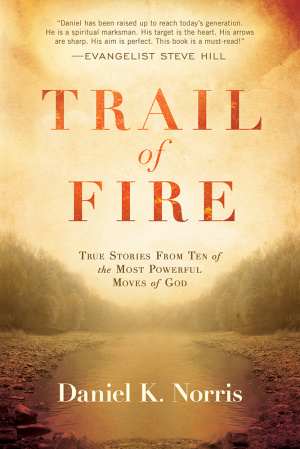 With compelling, page-turning stories never before heard—some from the library of late evangelist Steve Hill—Trail of Fire describes moments in history when people encountered God and went on to transform their communities. A fresh revival is coming. Daniel Norris engages readers with themes and foundational principles related to revival. Each chapter reads like a novel rather than a historical treatise and provides action steps that readers can implement to cultivate and sustain revival in their lives and spheres of influence. Now is the time for those who hunger for renewal in their spiritual lives and are tired of the dull, dry routine of religious motion to boldly seek God for a revival in their land. Trail of Fire by Daniel K Norris was published by Creation House in July 2016 and is our 43133rd best seller. The ISBN for Trail of Fire is 9781629986821. Be the first to review Trail of Fire! Got a question? No problem! Just click here to ask us about Trail of Fire.